JEFFERSON CITY, Mo. The Missouri State Fair on Monday imposed a lifetime ban on a rodeo clown whose depiction of President Barack Obama getting charged by a bull was widely criticized by Democratic and Republican officials alike. "It's not unheard of for a rodeo clown, depending on how he reads his audience, to play politics a little bit," said Jim Bainbridge, the senior public relations coordinator at the Professional Rodeo Cowboys Association, based in Colorado Springs, Colo. "But this crossed a line. Clearly, when you're suggesting that the president should be injured, it kind of gets to a level of hostility that is inappropriate." Perry Beam, an attendee who posted a photo of the event on Facebook, has said it had the feeling of Ku Klux Klan rally. He said that, at one point, another clown ran up to the one wearing the Obama mask and played with the lips on the mask. The rodeo's announcer  whom some media initially identified as making the comments about Obama  sought Monday to distance himself from the clown's actions. Announcer Mark Ficken said through an attorney that the clown was wearing a live microphone and had given the announcer no advance notice about the skit. Ficken is president of the Missouri Rodeo Cowboy Association and also is superintendent of the Boonville School District. "He was as surprised as anyone with the appearance of an Obama-masked rodeo clown," said Ficken's attorney, Albert Watkins of St. Louis. Watkins said Ficken's only comment during the event was to say, "Watch out for that bull Obama!" Watkins said that was meant as a warning for the clown's safety. 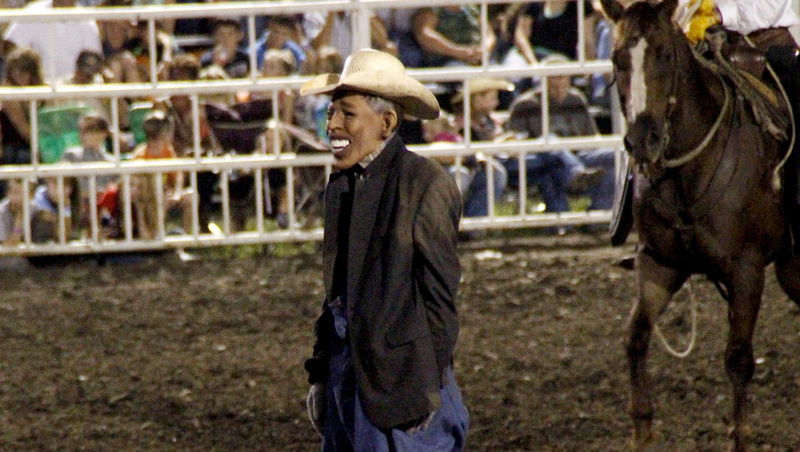 Fair Marketing Director Tammie Nichols said the rodeo clown was hired by Missouri Rodeo Cowboy Association and that fair officials did not know he was going to mock Obama. The association did not respond to an email request for an interview Monday and had removed the names of its officers from its website. A statement on the site said the association's directors are "dealing with the situation firmly and quickly as this type of behavior will not be tolerated. " State Rep. Steve Webb, chairman of the Missouri Legislative Black Caucus, said Democratic Gov. Jay Nixon should cancel the governor's annual ham breakfast scheduled for Thursday at the fairgrounds. But Nixon spokesman Scott Holste said the governor did not plan to cancel the breakfast because of the "deplorable actions that took place during this one event."